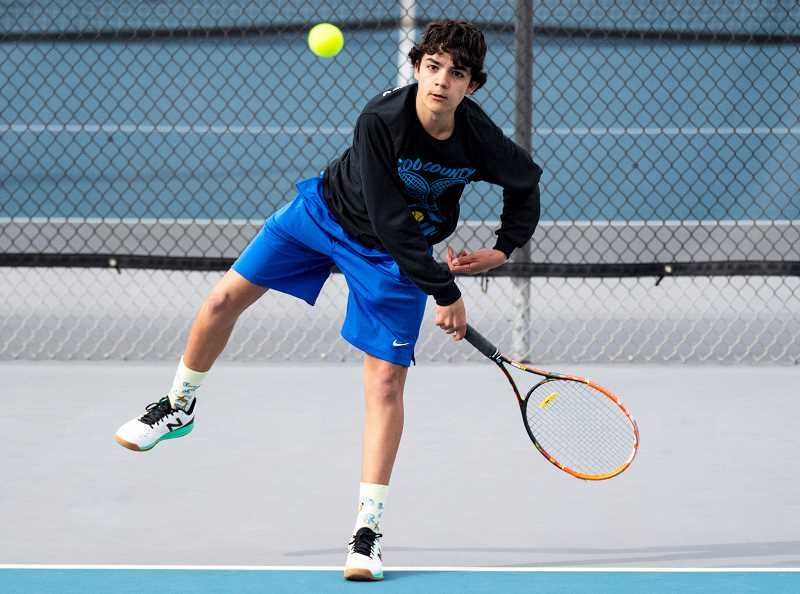 The Crook County High School boys tennis team has had a mixed record early in the season. The team has had some success in singles play but has struggled with their doubles teams. Crook County head coach Jonny Oelkers says that is because the bulk of the team's experienced players have been playing singles, where last year, the team's strength was often in doubles matches. "We are actually looking pretty strong in singles, but everybody is pretty new in doubles," Oelkers said. "We haven't seen any of the teams in our league this year, but we will play everybody twice, which is different this year, and we will get a sense of where we are. Our top two players may switch to doubles, depending on how well they do." Foreign exchange student Pablo Casado, from Spain, has locked up the No. 1 singles position for the Cowboys. "Pablo has been playing tennis since he was four," Oelkers said. "So, he's pretty experienced." Playing No. 2 singles so far this year is Moses Freauff, who combined with his older brother to make it to the state tournament last year in doubles play. Casado is undefeated so far this year but has been looking online to see what the competition is going to be like in the league season. If it turns out that he is one of the top one or two singles players in the Intermountain Conference, then both he and Freauff will likely remain in their current singles positions. However, Oelkers says that if they are farther down the singles ranks, then the two players may team up later in the year to make a run at state in doubles. The remaining two singles players so far this year are Jordan Owens and Garrett Bond, who both have three years of varsity tennis experience under their belts. Oelkers said that it feels like they are just starting the season, even though the team has gone through about a third of the normal practice time. With snow on the courts for the first two-plus weeks of practice and then frequent rain, both the practice and match schedule has been disrupted. "The snow and the rain we've had has been kind of rough," Oelkers said. "But it's all good. The team is working hard." In addition to not having a lot of experience on their doubles teams, the Cowboys are also struggling with numbers. For the past two or three years, there have been as many as 17 or 18 players on the roster. This year, the roster lists just 13 players, and a couple of those have missed some practice time for other commitments. The result is that in early-season matches, the Cowboys have been forced to forfeit some of their doubles matches. With two team members missing this week to prepare for a wrestling tournament in Reno, Nevada, the Cowboys were forced to forfeit two doubles matches in a dual earlier this week against Mountain View. However, Oelkers expects to have a full team the rest of the season. Long-time girls tennis coach Lloyd Rodgers had run a summer tennis program through the Crook County Parks and Rec District for years. Last year, Rodgers retired from coaching, and there was no summer tennis program. Oelkers believes that has contributed to the shortage of numbers on the team this season. "I'm starting a summer program for younger kids through parks and rec this summer," he said. "Last summer, there wasn't a summer program, so we are starting it back up." Adding to the uncertainty this year, the Cowboys have moved up from Class 4A to Class 5A. Oelkers said that the team is unfamiliar with most of the teams in the new league, although they have played against Redmond and Ridgeview in the past. However, since league teams are going to play each other twice this year where in the past they have only met once, that gives the team time to familiarize themselves with their new opponents, giving the team an opportunity to experiment with different lineups. Oelkers added that he feels like despite the late start and the shortage of players, things are going well and the team will be fine. "We don't know what impact moving up will have," he said. "And we struggled with a little bit of a late start and the weather, but so far, it's been good."